Hunter Thompson is a fantastically knowledgeable interviewer! I first heard him on the Tom Woods Show and then started listening to his podcasts. 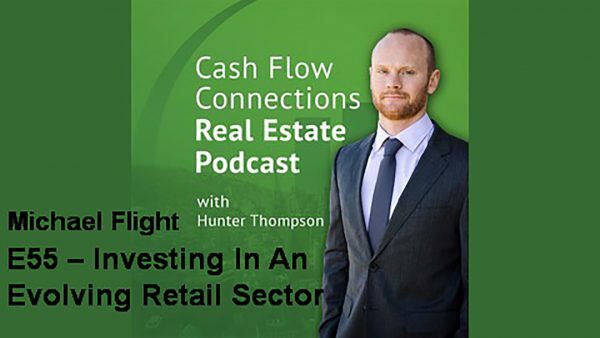 I subscribe to Hunter’s Cash Flow Connections (CFC) podcast and have learned something new from having listed to his podcasts. Hunter has very experience guests who are experts in the asset classes they discuss. Hunter is Managing Principal for CFC that is headquartered in Los Angeles California. CFC assists investors who are seeking passive cash flow focused real estate investments across multiple-geographic locations. CFC provides low-risk real estate opportunities that provide a reliable source of monthly income for investors. Hunter is also the author of “Rest Easy Real Estate” a short eBook that summarizes the low-risk cash flow focused investment philosophy. Online shopping has been a blessing for some, and a nightmare for many others. E-Commerce stores have been putting pressure on many retail tenants, especially those who only offer physical products. However, despite all of the negativity, this can create a very unique investment opportunity. In order to take advantage of this opportunity, it is important to talk to an expert in the sector to discuss what is taking place in the asset class as a whole. Today our guest is Michael Flight who is a real estate entrepreneur and an expert in retail real estate investments. He has invested in more than $500 million of real estate for himself or on behalf of investors and clients over the past 32 years. Michael formed Concordia Realty Corporation with a partner in 1990 to invest in shopping centers with a strategic focus on adding value through repositioning and redevelopment all over the United States.